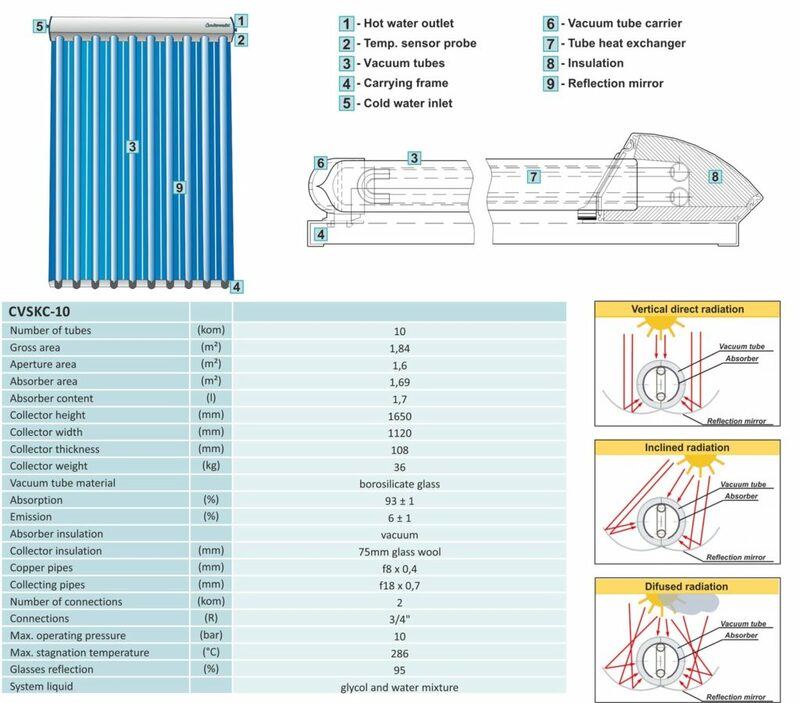 The CVSKC-10 vacuum tube solar collector has been engineered to meet a typical market need, which is for high efficiency in less than ideal conditions. This vacuum tube collector shows advantage in exactly that situation, when flat plate collectors lose their efficiency, during low radiation periods or when there is high temperature differences. The collector tubes are evacuated, which cuts energy loss. Under the tubes there are parabolic mirrors, which direct radiation towards the whole absorbent surface and increase its efficiency. High efficiency vacuum tube solar collectors with 10 tubes and 1,84 m² gross area. Between the two layers of glass tubes there is a vacuum, so that no rubber joints are necessary. Absorbant surfaces are coated with a specific high efficiency coating surrounded in the copper pipes inside the vacuum tubes made of borosilicate glass. Collector pipes are situated inside a waterproof aluminium casing. Below each vacuum tube there is a parabolic mirror which harvests energy from the whole absorber surface. This is particularly important during the low angle sunlight periods. Stagnation temperature of the collector is 286°C. The integrated frame of the collector makes assembly easier. The collector is mounted on the roof using an installation set (additional equipment) or on a free-standing carrier. 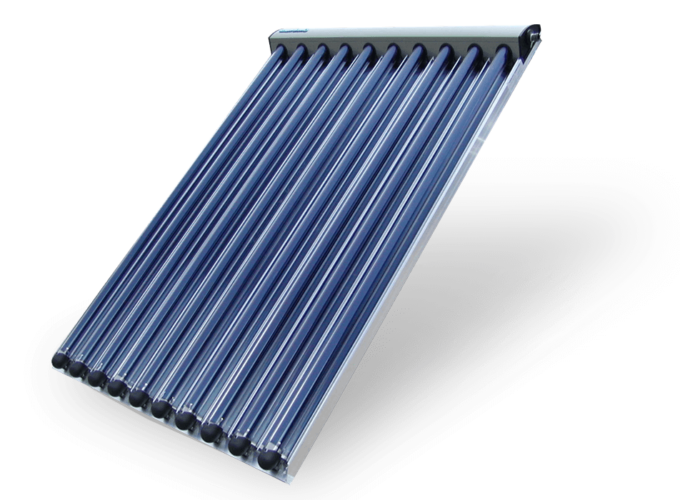 By integrating solar collectors into domestic water heating systems (STEB water heater), swimming pool water heating systems and central heating systems (CAS-S, -BS accumulation tank), use of conventional sources of energy can be saved or avoided and, at the same time, environment pollution can be reduced.